One of my favorite bloggers / writers, Seth Godin, writes about “When the long tail is underwater” on his Oct 10th blog. He actually touches on a couple of interesting points, how much time and energy is created that generates no value, and how do we filter out all of this information to understand what is relevant. Take for example the Droid/iPhone app market…Apps are everywhere, and try to do everything. Apple and Droid both claim wildly unusable numbers of apps. With all of these potential apps, ask your friends what Apps that they can’t live without and people get strangely quiet. I had a few people respond Urban Spoon and one guy mentioned Wolfram Alpha. Seriously, hundreds of thousands of apps out there and we can’t create a list of “gotta have” apps? Yes, I know there are hundreds of those lists. Read one of those lists and ask yourself which one will you be using a month from now. How much data do you have? How many reports do you have? How much of it is relevant? How much old stuff is out there that no one has any idea of its worth? How often do you clean up the environment? How quick do people respond? AND how often do you hear people say… I don’t have the data? OR I am not sure where I can find the information I need? 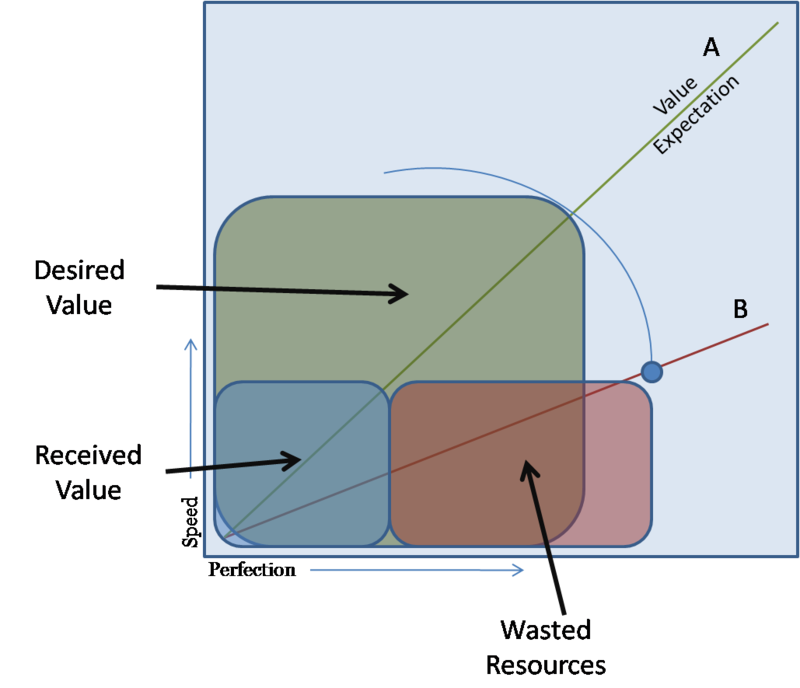 One of the areas where performance takes a giant hit is in the area of project initiaition or closure. And this is further complicated by personal preferences, politicing, and portfolio management. In the diagram below there are three lines. Line A is Corporate or Organization expectation of the trade off between speed and perfection. Projects or tasks with little value (lower left corner) should require lower expectations of research, analytical thought, and discussion. 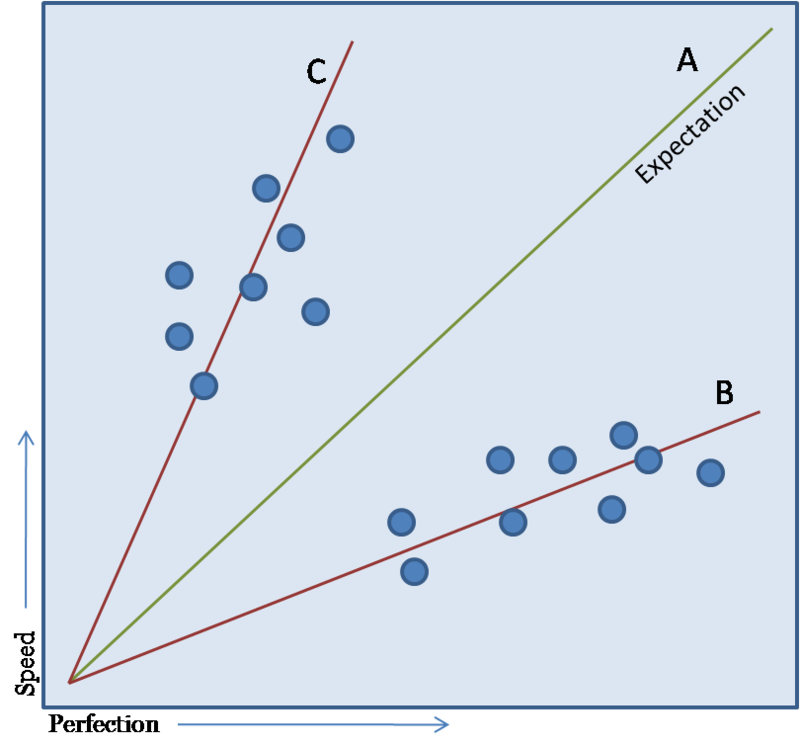 While projects that are higher in value (farther up to the right) should have higher expectations on quality of thought and preparation. What happens all too often is we see line C where people don’t have the capacity or time to do the right job and throw something together. We see that in the end we deliver far less than desired while wasting resources. 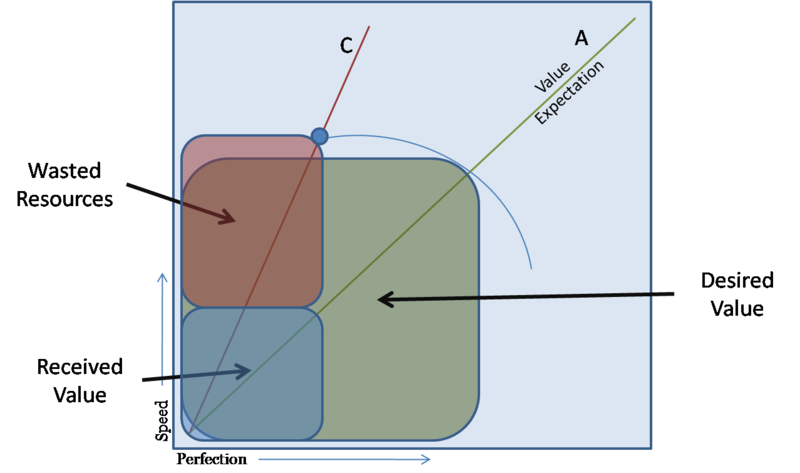 The small blue box is the value received, the red box is the wasted resources, and the green box was the original expected value of the project. 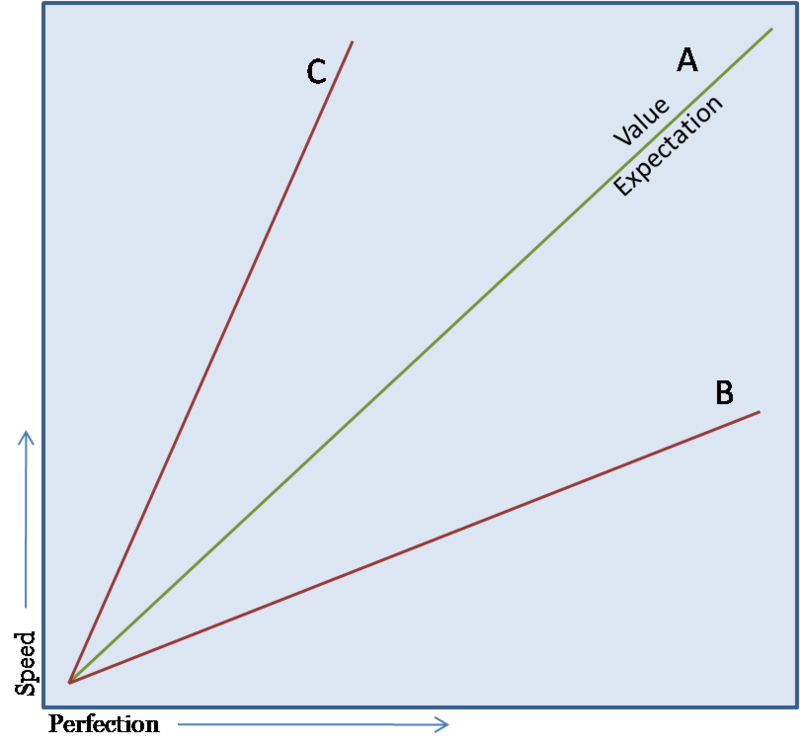 The arc is the value frontier, which demonstrates the trade off value between speed and quantity – or what we expect in terms value created from a combination of speed and quality. Or we have line B where we basically have a failure to launch because we spend all of our time debating how to be perfect. Very similar to the situation with line C where we deliver far less than originally desired while wasting similar resources. Is this an individual issue, or a management issue? If we were to plot out the results of the individual projects how would your organization look? If we were to see trends like the circles above, this would indicate a management problem. As management either did not get the individual(s) to move back to the expected line, or management places to high a premium on either speed or perfection thus artificially altering expecations. What I have witnessed is that line B is more often the norm. Line C typically causes painful exposure, which causes people to be more fearful, thus needing more inputs and more support. This creates more meetings, more approvals, more time, more people, which again causes more information, more analysis, more debate. It is a vicious circle. Failure to Act is a companion blog.